Now, I do wish this was an original concept but it wasn't. I found a tutorial on Taste of Home but I used our favorite bread recipe which is the easiest recipe EVER. I first learned about it from Marie at Make and Takes but it appears to be all over the web. Here's the Make and Takes version. I didn't want to do an egg wash on my Santa because I wanted to keep it vegan plus I really don't like the smell of cooking eggs. I brushed my Santa's beard and the ball on the top of his hat with salt water. 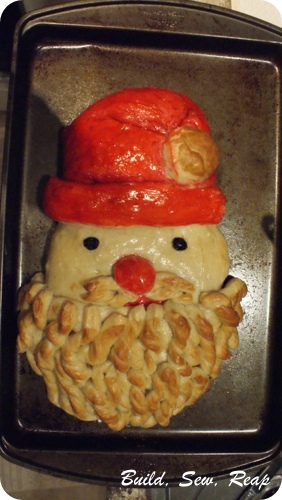 To get the red for his hat, nose and lips, I just painted the dough with vegan butter substitute mixed with red gel food coloring. Finally, I used two raisins for his eyes. The project was fun and I liked how he turned out.